Sheila has spinal adhesive arachnoiditis of the thoracic and lumbar spine caused by single injection spinal anesthesia containing 5% lidocaine and epinephrine that she received during a routine knee arthroscopy in 2007. Like most medications used in these procedures, this drug is NOT FDA approved for spinal injections. Sheila has no history of back pain, back injury, or back surgery prior to receiving this injection. 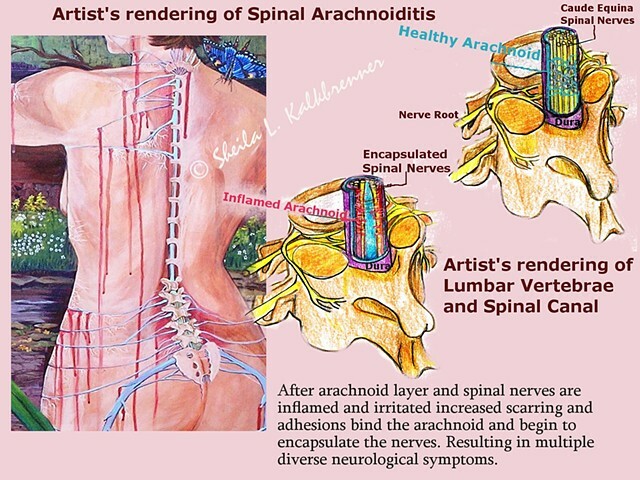 Arachnoiditis is a spinal cord injury with associated chronic pain and neurological complications. Arachnoiditis is caused by spinal injections and invasive spinal procedures. These assaults on the nerves within the spinal canal cause inflammation and scar tissue which damages the nerves and impairs the natural rotation of cerebrospinal fluid. Arachnoiditis Survivors must seek assistance from the community which caused the condition. Efforts are often made to conceal these adverse outcomes. It is a long journey for each of us to find reliable, accurate, trustworthy care and support. It IS out there.